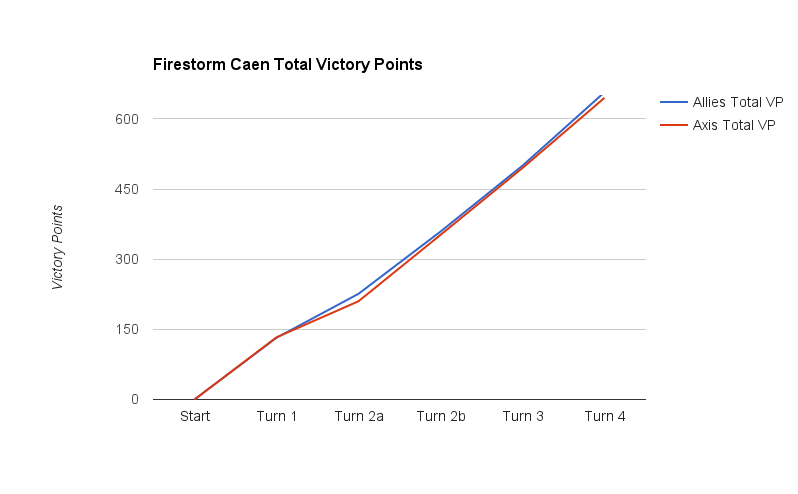 Turn 5 is the final turn for the Firestorm Caen campaign. Final campaign victory points are calculated from points for territories held and points for Firestorm Troops destroyed. Allied forces will need to capture lots of territory to be able to compete for the final campaign victory. With 6 attacks this turn, a strong turn from the Allies can turn the final result around. 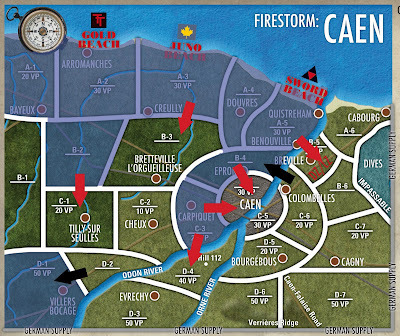 This turn features the first assaults into Caen itself. Unfortunately, the troops won't have time to capture the entire city but can win major points with the people back home if they are able to capture at least part of the city. Supreme Allied Commander Eisenhower and the rest of the Allied High Command are becoming frustrated with the lack of progress in the British sector. Montgomery needs a strong showing in this final turn to protect his job and show that Britain is still an important player in the war. 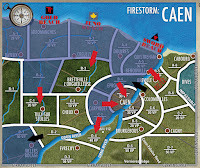 You can see all of the posts in this series so far by clicking on the Firestorm Caen tag. The map was getting unwieldy with all of the Firestorm troops on it. The red arrows are Allied attacks. The black arrows are German attacks. After the breakthrough in Epron, Allied forces are positioned on the Northern outskirts or Caen. The British forces have massed British and Commonwealth armor for a decisive assault to capture all of Caen South of the Orne River. This assault is crucial to the Allied success in this campaign. The fanatical Hitlerjugend of the 12. SS Panzer Division have moved in to support the German troops. They have been commanded to hold their ground at all costs. Grenadier Platoon-CT 1 Command Panzerfaust/SMG, 4 R/MG teams, and a 7.5 cm Pak 40. 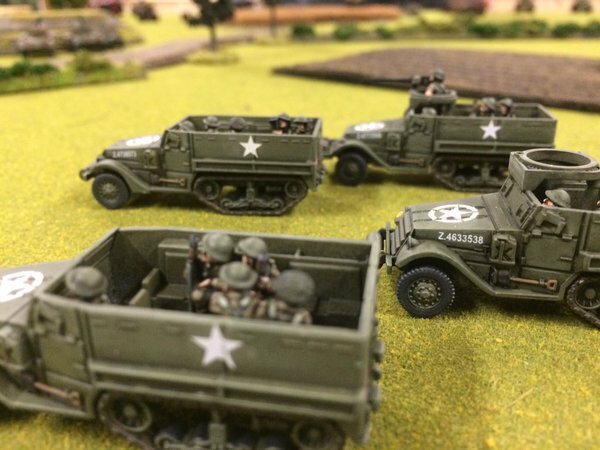 Some lovely half-tracks from Rob T.
Operation Charwood was supposed to capture Caen itself after an extensive bombing campaign. Fierce resistance around Carpiquet slowed the Allied advance. 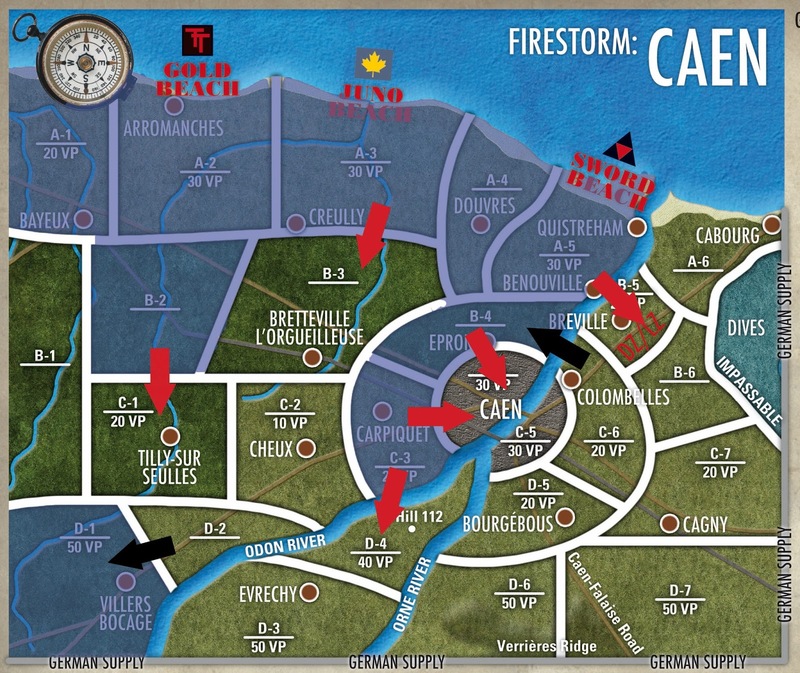 After capturing Carpiquet, Allied forces have regrouped for an assault into Caen from the West. The Allied forces have committed the tough Canadian and Scottish troops to the battle. Unbeknownst to the Allies, the Germans have brought the new Tiger II tanks into Caen. After unloading the King Tigers from rail cars at night, these behemoths are ready to be used in the defense of Caen. A great picture from Morgan. Allied paratroopers and glider troops captured Breville on D-Day over a month ago. Since then, repeated German attacks have forced back the weary troops. New reinforcements in Sword Beach have allowed the Allies to launch another attack to capture Breville and threaten Caen from the North. The Allied paratroopers that captured the city initially are a broken force and have been sent back to England for rest, refitting, and replacements. After a month of fighting, much of the beautiful Normandy countryside is a smoldering ruin. Weeks of fighting and bombing have left the once-beautiful town of Tilly Sur-Seulles in ruins. Despite this, the fight continues as Allied troops attack through the rubble and wreckage to relieve the 7th Armoured Division that is still holding out on Villers Bocage. Despite being surrounded and attacked from all sides, the Desert Rats continue to build their fame with guerilla fighting to maintain control of the area around Villers Bocage. Knowing they will face a long walk to Germany if they lose, the 7th Armoured Division and the 50th Northumbrian Infantry fight on. Allied forces have launched assaults to relieve the beleaguered forces. Will help come in time or will the 9th SS Panzer Division succeed and recapture Villers Bocage. One of the greatest tank battles in history is nearing it's conclusion. Operation Epsom was launched to capture the land around Bretteville L'Orgueilleuse in anticipation of a push into Caen. Unfortunately, the German troops in the area had other ideas. AS the Allied forces attacked into Carpiquet, the German forces launched a bold counterattack to recapture the lost ground. Over a month into the campaign in Normandy, the British forces once again are looking to expand and protect their beachhead from German artillery barrages. Allied forces around Caen are now pushing South to secure the high ground on what has been labelled as Hill 112. This inconspicuous hill provides a perfect vantage point from which to direct artillery onto the Allied forces attacking Caen. The 51st Highland Division has been tasked with capturing the hill. Although German reinforcements have been whittled down by the fighting, confident German commanders have launched an offensive to recapture Epron and threaten the Allied flank. The powerful 1. SS Panthers have been sent to recapture this valuable ground. Graph of total Victory Points so far in the campaign. Very close! Remember to send your results in the following format to rustandthecity at gmail.com. Turn 5 results should be submitted by February 1, 2016! Results emailed last night and AAR up! Thanks for running this mate. I wish I could have played more of the turns.